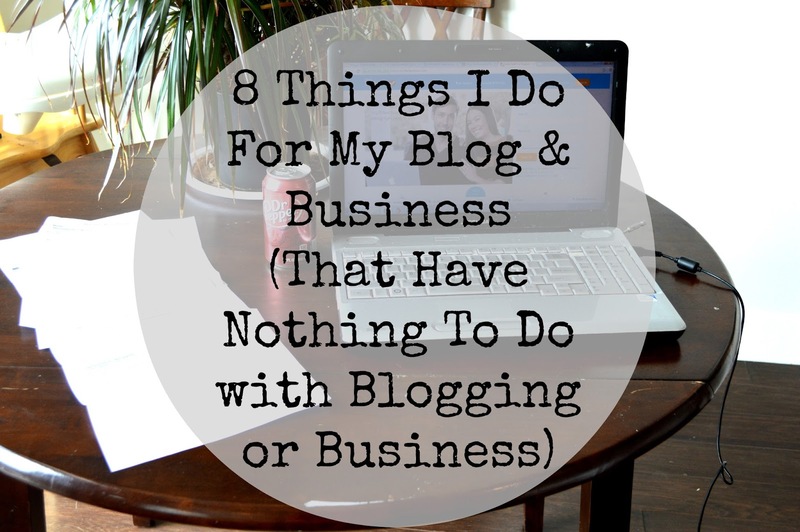 Lately the blogging about blogging posts have been all the rage, and you know what? I like the rage! Let's hear it for rage! It's so much fun! If you can't talk about blogs on blogs, where can you talk about blogs since the rest of the world thinks all bloggers are crazy? I kid. I kid. Kind of. There's been a lot of how to posts going around so that we can all figure out how to be terrific bloggers. And the truth is that you really do have to do all those things that everybody says- comment on other blogs, make your site look nice, sponsor, etc. But the best stuff I do for my blog I do away from my computer. It isn't the pretty blog aesthetic and the twitter account and the countless comments on other blogs that make people stay on a blog. It's the blogger. The person. 2. I walk the dog. For some reason it's when I'm walking the dog all by my lonesome that some of my best blog ideas are born. Lately I've been all bundled up, just walking along, enjoying the rare sunshine when some inspiration hits. The fresh air clears my head, and I'm allowed to think uninterrupted. You see, lots of ideas try to creep into my head all day long, but the problem is I'm usually so busy focusing on a lesson on parts of speech or a left hand turn lane that those thoughts have no room and quickly leave. When I'm walking the dog all by myself those thoughts are welcome to come in. If you don't have some quiet time for clearing your head at least once a day, you should! 3. I hang out with my friends. Hanging out with my friends is crucial to the quality of my blog for a couple of reasons. One reason is they help my social skills. Isn't that weird that we have have to continually hone and work on our social skills? But we do. Hanging with my besties on the regular I feel like keeps me not only socializing correctly, but grounded and sane and happy. Plus, they're a huge support. They always tell me they read my blog and then they make fun of rude commenters for me and tell me that anyone who hates my blog is an idiot. It's good for the soul. 4. I teach high schoolers. There was a day when I wanted to blog and blog only for a career. Then I realized that being confined to the internet full time would be my own version of hell. I love this blog, and I love the people who read and comment. This community means the world to me. But there's a lot of junk that comes along with having a big life online and I think I am in as deep as I ever want to be. Also, I really enjoy leaving my house, talking with real people, and helping solve real problems. I love teaching and don't know if there will be a day when I want to be done. For now, my part time gig is everything to me. And I feel like teaching only makes me a stronger blogger. My time management is MUCH better when I have to juggle so much, and besides that those young bucks keep me hip. How would I ever know what on fleek means without them? I mean, come on, these are crucial skills! 6. I go on trips. As often as the budget allows! I (like every other blogger in this world) love traveling. In August we went on a seven day cruise and I didn't touch a piece of technology the entire time. It was wonderful! The blogging and social media world can get so wildly insane, and I feel like sometimes you just have to take huge steps back, go away for a little while, and remember who you and why you are doing what you are doing. I had some experiences on the cruise ship, all alone enjoying the sunset on the deck, where suddenly life seemed so clear and simple to me. I was more than excited to get back to blogging after the seven days were up, but that time for just me was absolutely necessary to keeping me happy and balanced. But it doesn't have to be huge trips! Sometimes you just need a vacation from social media. A two or three day break from instagram often leaves me feeling refreshed and clean. Also I just stopped following a huge amount of people that I realized it does nothing for me to follow them on social media. Most of these are huge bloggers with 100K+ following and I just realized there was no reason for me to follow- no connection, no inspiration, no motivation. So I stopped. And I haven't missed it one bit. 7. I hit up the gym. (Sporadically). I don't know why I put this in here. Mostly I just want to brag that I have set foot in a gym. Applause! Applause! Um... actually the exercise feels really good to me. Wearing myself out physically somehow makes me stronger mentally. I can't explain it, I just know that I feel so rejuvenated and cleansed after a good work out, and I come to my blog with more to offer. Isn't that crazy how that works?!? 8. I spend time with Greg and June. Greg gives me confidence and he is always interested in the progress of my blog. He was far and away the biggest supporter of me starting Hey June. (And he also makes and packages a lot of the necklaces!) It's cute how he asks me how many page views I got and what blog I'm sponsoring next and how many necklace orders we had for the day. His support is a huge help to me. But it's not only the support, it's the time that I am able to focus on and love someone and I guess just feel so totally human. Having someone to love and care about so deeply enriches all of my human emotions and allows me to be a more honest, real, and vulnerable writer. And June Bug... well she just makes everything better in life just by being there. Even when she is destroying the pantry. Anything I missed? Fill me in on what you do to keep your sanity in the ever crazy world of blogging and small business.